Part of me started to panic that perhaps he thought I should spend a bit more time weeding and tidying. Then I remembered that these folks weren’t gardeners, so his question was most likely amazed curiosity—something akin to my asking my neighbor with more than 20 cats how many cats she has. Now, to be fair, I don’t spend nearly as much time gardening as some people I know. My friend at Fairegarden is out scrambling around early in the morning every day of every month of every year. She, like Gail at Clay and Limestone, even don head-to-toe clothing and netting to protect themselves from the tiger mosquitoes in Tennessee. 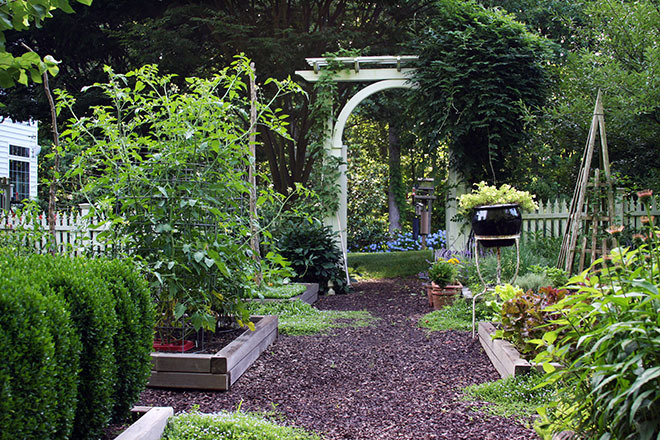 And then there’s Layanee’s Rhode Island garden at Ledge and Gardens—a place so beautiful she must spend hours and hours keeping it just so. But I do spend a fair amount of time out there gardening. This year for the first year since we moved here that most of my time hasn’t been spent watering and weeding. Nature has favored us with regular rain and some beds have filled in so that weeds have no place to take hold. I have spent much more time planning and planting, moving plants to new locations and even just walking around and thinking about things. Although I enjoy the whole process of gardening, from the digging to the hauling to the plant shopping (yippee! ), I admit that the best of the best is wandering around and just looking at things grow. I never, ever tire of watching how the garden changes from day to day and even from hour to hour as the sun moves across the sky. I am amazed at the variety (and quantity) of the butterflies and bugs that make their home here. I am grateful for having a sense of smell so that I can appreciate the garden with that sense as well. Honeysuckle, roses, jasmine and cut hay combine to make the air better than any bottled concoction on sale at Nordstrom. Your garden has inspired me to create a potager garden, it truly is lovely! The weather has been most cooperative this year here, as well, Robin. Your potager is sublime and your answer to the question was perfect. 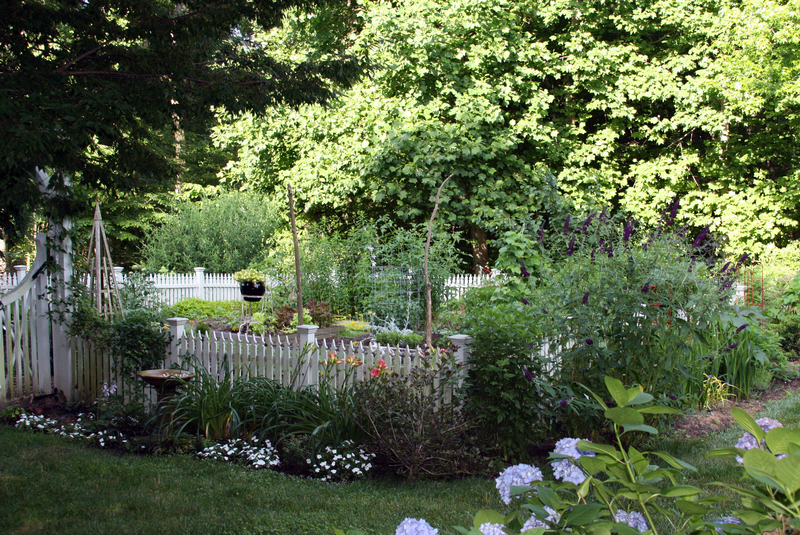 Thanks for the linkage and you are so right about the best garden time being spent just walking around looking at it. Oh, it looks quite lovely and I have seen that beautiful potager in person.I still remember that swiss chard. Today it is much to hot to garden…well, those early hours are good but I slept through them unlike Frances. Can’t wait to see it in person. And to see YOU. And who says we don’t have skeeters in Maryland??? Wish we were going to all be gathering this week in SF. It won’t be the same w/O all the original flingers. Robin your gardens are beautiful, just like you! Thanks for the stroll this AM, as I brace for Mother Nature’s dish of brutal temperatures and high humidity. Lovely garden, and lovely thoughts. Oh I would love to sit a while on that bench of yours and just soak it all in. 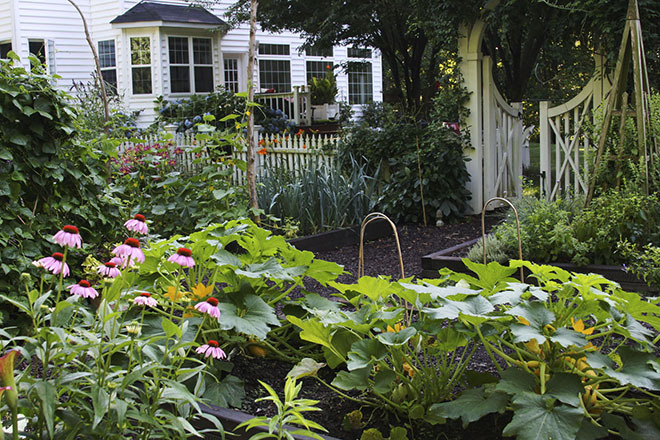 Your gardens look amazing – just beautiful! Oh wow how lovely and you have done an amazing job with this …so lovely .